Birdo (キャサリン, Catherine) is a character from the Mario universe. Birdo as a boss in the Super Mario All-Stars version of Super Mario Bros. 2, which her appearance in in Mushroom Kingdom II is based on. 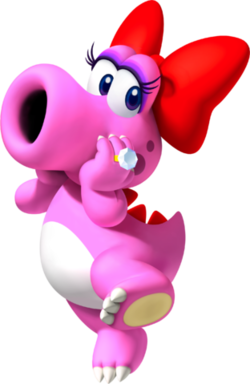 Birdo is a character and species in the Mario series who debuted in Yume Kōjō: Doki Doki Panic as a recurring boss at the end several levels. In the game, Birdo attacks by spitting eggs at the player and is defeated by grabbing the flying eggs and throwing them back at it three times. Later worlds introduce differently colored Birdos which also attack with fireballs. 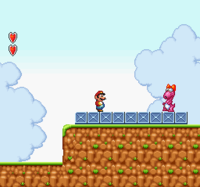 Like much of the content in Doki Doki Panic, Birdo was retained when the game was reworked for its North American release as Super Mario Bros. 2. Since then, Birdo has appeared in numerous Mario series games, being a boss once again in Super Mario RPG: Legend of the Seven Stars and Mario and Luigi: Superstar Saga, and a playable character in several installments of Mario spinoff series such as Mario Kart and Mario Party. Birdo's gender remains indeterminate, being described as a male who believes he is female in Super Mario Bros. 2's instruction booklet. Most other game appearances refer to Birdo as a female. One mission in the 2008 Wii game Captain Rainbow is a play on Birdo's gender confusion, tasking the player to find evidence that she is female after being locked up for using the women's restroom. Birdo is a stage hazard in the Mushroom Kingdom II stage. It appears on either side of the screen and shoots one or three eggs from its mouth before exiting to the side where it came from. Birdo can be attacked and will temporarily retreat after receiving enough damage. Birdo's eggs deal damage to those they hit. These eggs can be shielded against, jumped on, knocked away with attacks, and air grabbed. When air grabbed they are usable as items that deal 24% damage when thrown normally, explode and deal 49% when smash thrown, and occasionally drop items after breaking. It is the only item in the series that can explode by input rather than chance. Zelda holding one of Birdo's eggs. The Birdo trophy is obtained randomly: when this happens, Mushroom Kingdom II is unlocked. Like in that stage, Birdo has an 8-bit sprite. First seen in Super Mario Bros. 2, Birdo is known for shooting eggs and fireballs from her mouth. Mario and friends would have to jump on to the eggs in midair, pick them up and throw them back at her. Long missing from the Nintendo scene, Birdo recently reappeared in Mario Tennis and Super Mario Advance. Birdo only appears as a trophy , carrying an egg with it's new design. A pink creature of indeterminate gender that some say would rather be called Birdetta. A big ribbon on its head is its most distinguishing feature. In Super Mario Bros. 2, you can return fire on Birdo by jumping on the eggs shot from its mouth. Be careful not to get psyched out by fake-egg fireballs! Once again, Birdo only appears as a trophy , behind an egg with it's new design. Birdo's debut wasn't in a Mario game at all but in a game called Doki Doki Panic. Originally released in Japan, a version of that game made it to the West under a different name. Mario and friends replaced the main characters, and the game was called Super Mario Bros. 2. That's how Birdo joined the Mario Bros. family! Birdo's debut wasn't in a Mario game at all but in a game called Doki Doki Panic. Originally released in Japan, that game made its way to the West with a few changes: Mario and Co. replaced the main characters, and the title was changed to Super Mario Bros. 2. That's how Birdo joined the Mario Bros. family! Birdo returns alongside Mushroom Kingdom II in its old sprite design in Super Smash Bros. Ultimate. It additionally appears as a Spirit, using artwork from it's new design in Mario Party 7. This page was last edited on February 12, 2019, at 16:28.